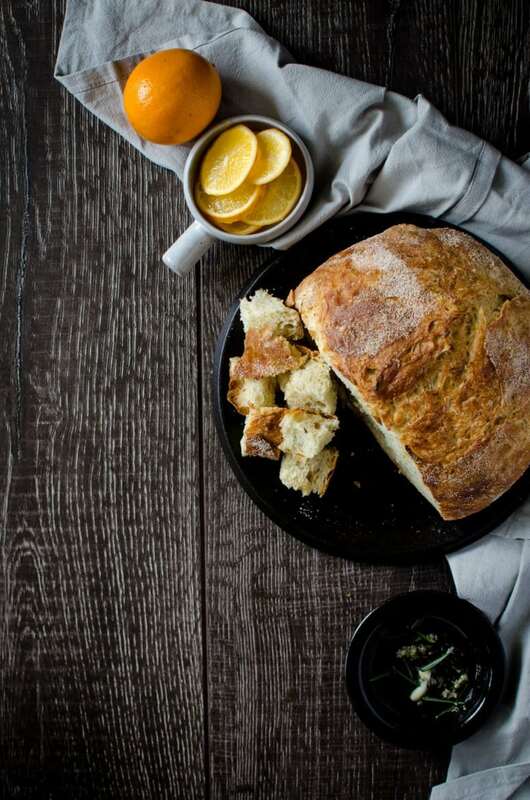 You are here: Home / Recipes / Breads / Meyer Lemon Rosemary Bread – Baked in a Dutch Oven! 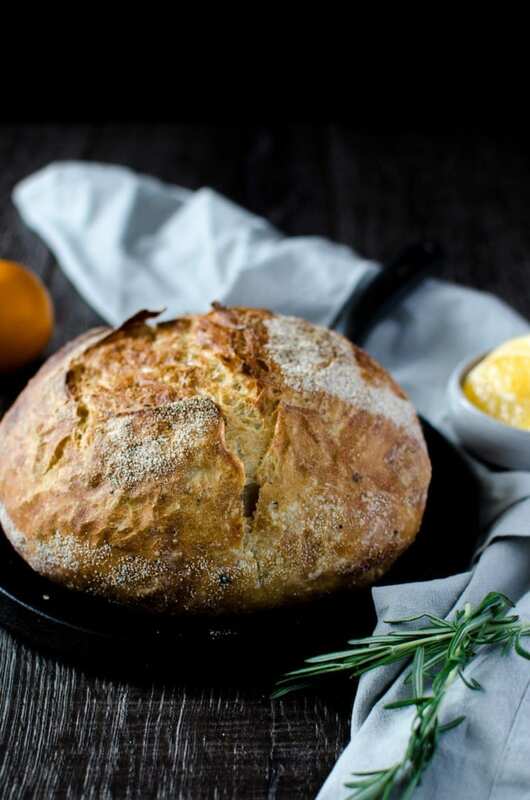 When your weekly menu needs a little comfort food with a touch of sunshine and cheer, try your hand at a loaf of Meyer Lemon Rosemary Bread! 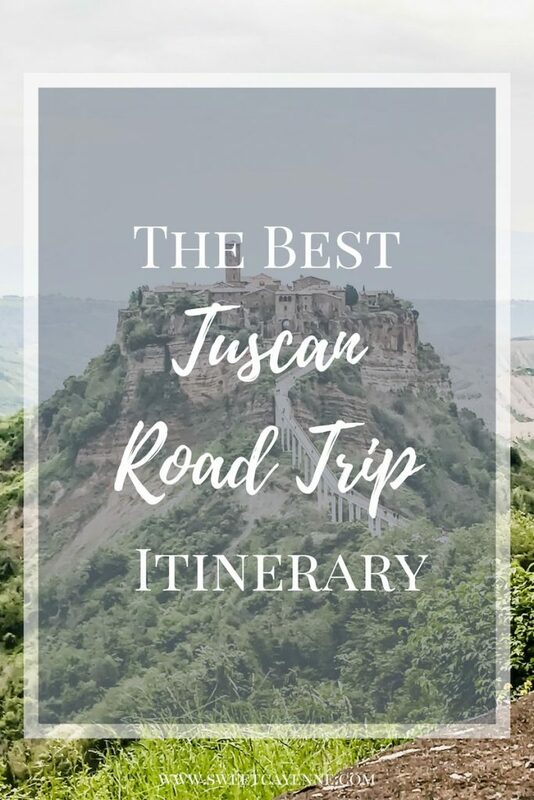 This post was originally published in 2016 and is one of my most popular posts on the blog! It has been updated this week to include new photos and a video. A few weeks ago, the February cover of Bon Appétit inspired me to try baking homemade bread in a way I had never tried before. 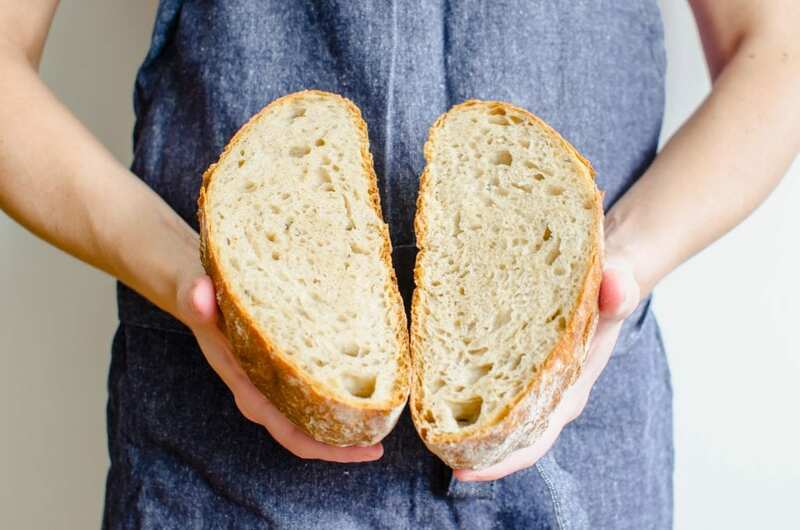 The picture-perfect loaf of bread on the cover looked like it was fresh off the bakery shelves, and the perfect roundness of the boule and crisp golden crust led me to doubt that it was actually made in a home kitchen and baked in a conventional oven. I thought “a loaf of bread that looks like that could never come out of my kitchen.” But the bread article was so convincing that if I tried this method of baking bread that required a long fermentation time on my counter but no kneading or fussing over it, I would forever be sold on it above all other bread-baking methods. The article was right! My friends, if you desire a way to make a golden, round bakery-style boule in your own kitchen, look no further. This recipe is it! 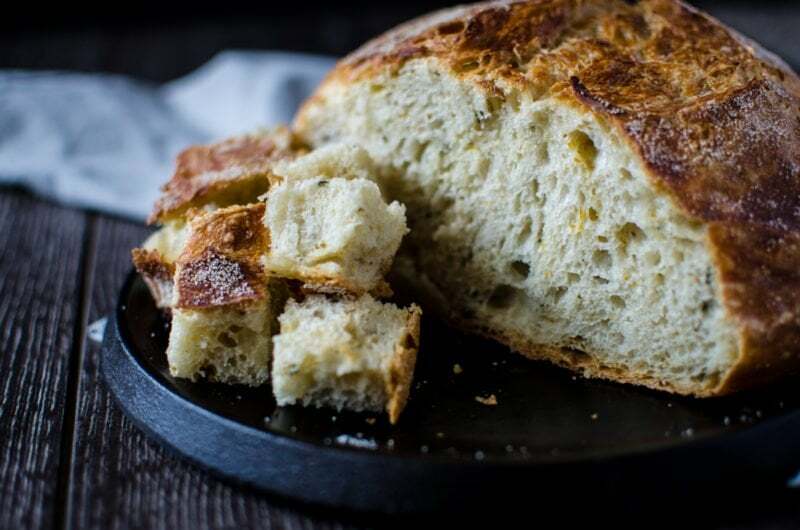 Other than the no-kneading, long fermentation time (meaning the bread dough rises for 12-18 hours the first rise), what really makes this recipe unique is that the bread is baked in a cast iron Dutch oven. As many of you may know, cast iron does an excellent job of conducting heat, so the sides of my pot get screaming hot all the way up, resulting in a round bread loaf that’s golden-crisp all over but soft and tender on the inside. Once I decided to try this new bread-making technique, I went on the hunt for a recipe that would make a Meyer Lemon Rosemary-flavored bread. I wanted to try and replicate the Meyer Lemon Rosemary bread at the baker of my dreams in Dallas, TX – Village Baking Co. I think about this bread all the time ever since I moved away from TX, wishing I could get my hands on the perfect loaf to serve with soups or make my sandwiches on. Eating a loaf of bread from VBC is, in my mind, what a true Parisian bread eating experience should be like (although I have yet to eat bread in Paris; I can only imagine! (Check that, I went to Paris in 2016!). The recipe I found from Williams Sonoma is a close-to-perfect match. The cheery notes of lemon and robust smell of rosemary flecked throughout the dough produce a gloriously clean and intoxicating smell that will permeate your kitchen as the dough rises and bakes. And once you’ve finished your bread masterpiece, you will be overwhelmed with a sense of pride and accomplishment that that loaf of bread came from your kitchen! Do you love lemon? Then check out my recipes for Meyer Lemon Scones and Lemony Chicken Orzo Soup! If you tried this Meyer Lemon Rosemary Bread, leave a comment below because I’d love to hear how it turned out for you! OR, upload a pic to Instagram or Twitter with the tag @sweetcayenne5. You can also follow me on YouTube if you liked the video. 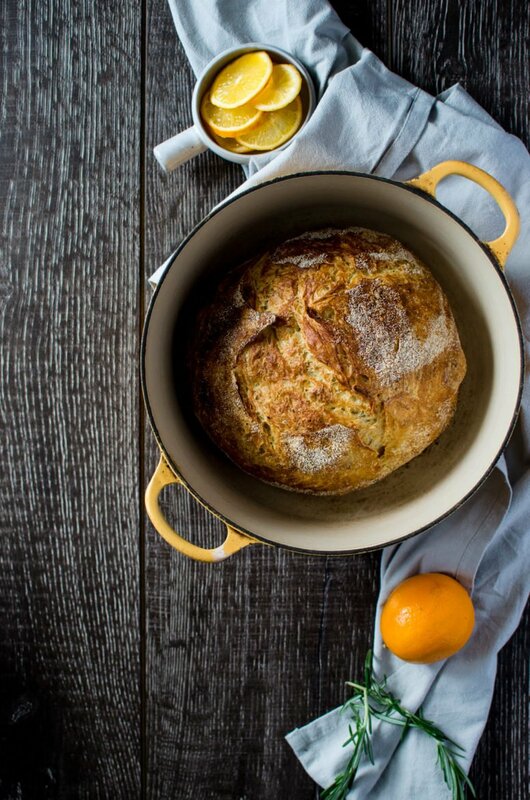 Meyer Lemon Rosemary Bread – in a Dutch Oven! Meyer Lemon Rosemary Bread is an easy bread you can make in a Dutch oven at home. This fragrant bread smells so incredible and looks like it came from a bakery! Recipe adapted from Williams Sonoma. Combine the flour, yeast, salt, rosemary and lemon zest in a large bowl by stirring with a wooden spoon. Add the water and stir until the dry ingredients are well-moistened and a shaggy, sticky dough has formed (I sometimes have to use my hands to lightly knead and work all the ingredients into a loose mass). Transfer the dough to a clean bowl coated with cooking spray. Cover the top of the bowl with plastic wrap. Let the dough sit at room temperature (about 70 degrees F) for 12-18 hours. After a minimum of 12 hours the surface will become dotted with bubbles - that’s a sign that ingredients are fermenting and flavor is developing! Transfer the dough to a lightly floured work surface. Sprinkle the top of the dough with a little flour and lightly knead it with you hands for about a minute. Cover the dough with plastic wrap on your counter and let it rest for 15 minutes. Generously coat a cotton towel (do not use terry cloth!) with cornmeal. Gently and quickly shape the dough into a ball with floured hands and place seam-side-down onto the center of the towel. Dust the top of the dough with more cornmeal and wrap the towel loosely around the dough. 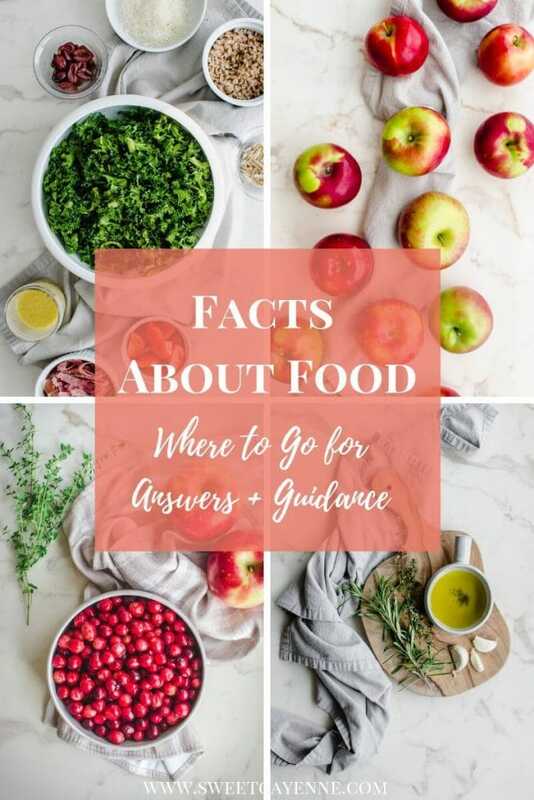 Place the towel with the dough in a large bowl and let it rise until the dough has double in size and does not quickly spring back when you poke at it. This should take 1 ½-2 hours. Thirty minutes before the dough is ready, place a 2 ¾-quart up to a 5 quart cast iron pot in the oven and preheat the oven to 450°F. Once your oven is preheated, carefully remove the pot from the oven. Open the towel and slide your hand underneath so that you can turn the dough mound seam-side-up into the pot. Give the pot a little shake to make sure the dough is even on the bottom and put the lid on top of the pot. Bake for 30 minutes, then uncover and bake an additional 15-30 minutes until the boule is golden brown all over and sounds hollow when you tap it with a wooden spoon. 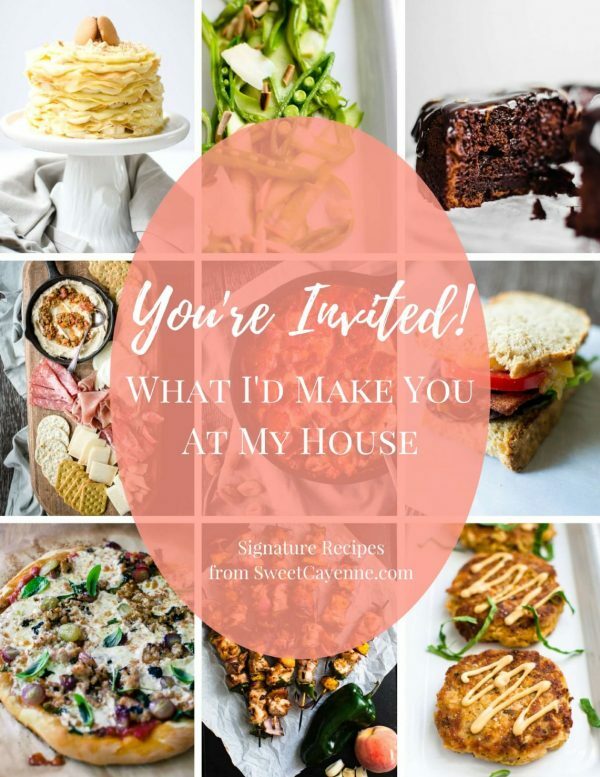 Your kitchen will smell absolutely amazing! wow, this is amazing! 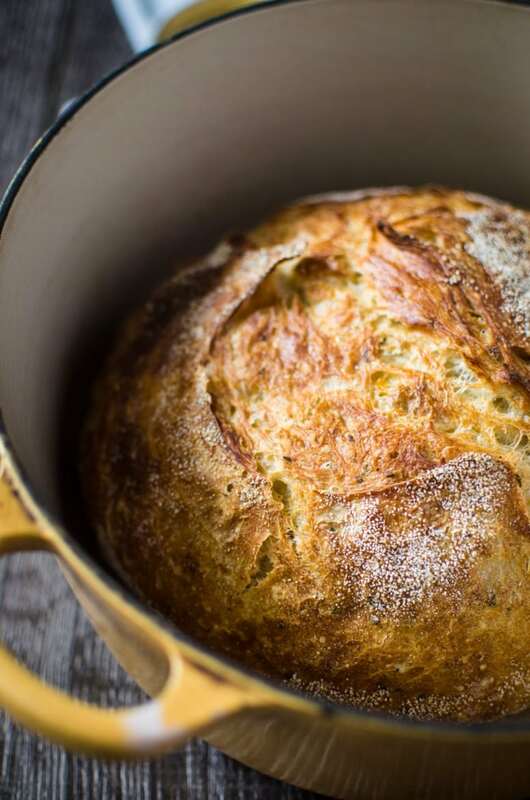 I love the idea of baking bread in a dutch oven! Thank you, Heather! Dutch ovens are the best – so many delicious things you can make in them!